I’m a self-confessed neat freak. Make that a clean freak too. Everyone who knows me will attest to my need for organisation. I’m the real deal too, not just one of those people who might keep one thing neat and tidy, and everything else in a mess. My need for organisation also extends to my travelling equipment. My suitcases are always perfectly packed. Everything has its own place. 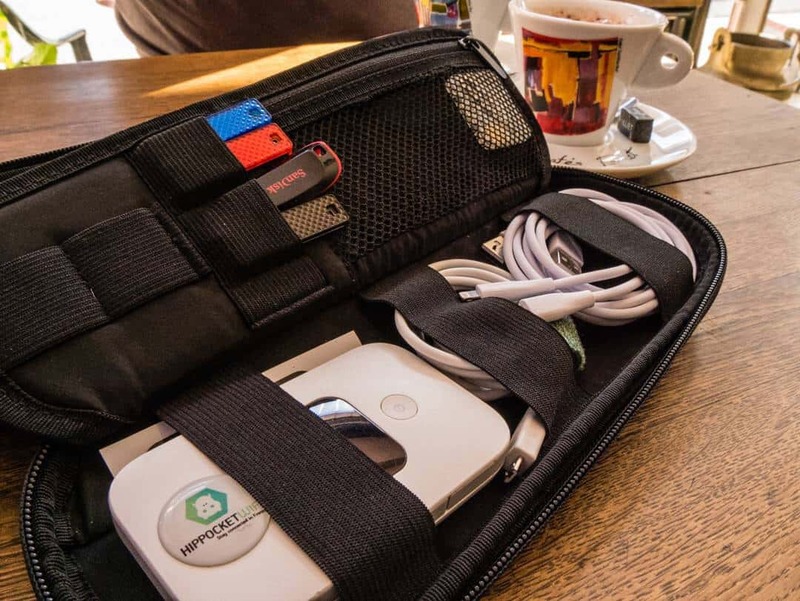 However, with the increasing requirement to travel with so many different devices, gadgets and cameras and their associated cables, it has become more and more difficult to keep them organised. With another motorhome road trip planned, I was keen to ensure our enormous cache of chargers, cables, hard drives, earphones and other technology were stored in an easy to access location. The Power Packer by up and coming company Side by Side was a perfect choice. 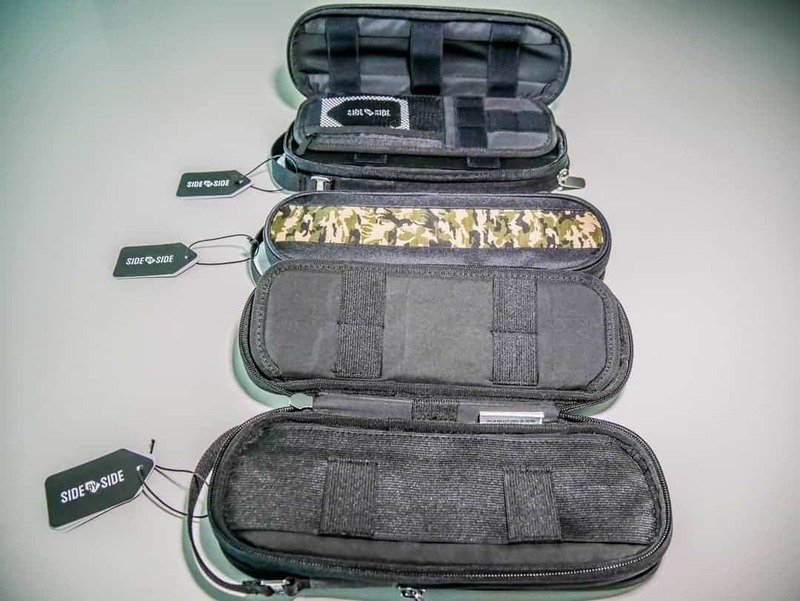 Available in a variety of colours the zippered cases are compact and easy to pack, yet large enough to fit a reasonable supply of items inside. They look great, but do they actually work? Let’s take a more detailed look at how I used the Power Packers and whether they truly helped me keep everything in its place. Available in three colours of camouflage, bordeaux and shadow, the cases are 26cm in length, 9cm wide and 4cm deep. My husband took possession of the camouflage one as soon as he saw it. I have no doubt this will be particularly popular. The external covering of the case is made from a very flexible and stretchy material. At first, when I saw this, I was concerned about their durability. Travelling can be rough on luggage and even though these would not be carried externally, I was concerned the pressure from the contents might be too much for the thin fabric. This was not the case and the fabric stood up to the various rigours of travelling. More importantly, it allowed me to fit a considerable number of items inside. The fabric simply expanded around each article where it needed to. Whilst I don’t necessarily recommend stuffing it so full that it loses its primary shape, it’s good to know there is some flexibility and I wasn’t confined to keeping only flat items inside. There are two robust external zippers that separate the outside compartment from those on the inside. Zippers can be really annoying if they are cheap and flimsy. Like the rest of the organiser, the zippers are really solid and don’t catch when trying to use them. A small handle at the top makes it easy to carry on its own. On the outside is a separate compartment, useful for keeping larger items. I kept an external hard drive in one and camera battery chargers in another. Power adapters for laptops could also be kept here. Inside the main compartment are two areas, separated by a movable divider. I put in as many gadgets as I could. Iphone and Ipad cables and chargers, adaptors, 12-volt chargers for use onboard the motorhome, small earphones, USB sticks, a power bank, camera filter, SD cards and travel sim cards. In another, my husband kept some of his drone peripherals. The contents didn’t move around once firmly tucked into their respective places. Soft elastic loops keep cables tightly held, whilst there are dedicated smaller areas to store USBs and SD cards. A small mesh zippered pouch can keep tiny things, likely to be lost, well secured. The flexible fabric was tested when we used one of the Power Packers to store laptop cables and drone batteries. Organisers with more rigid properties would not have worked, but here, the fabric simply shaped itself around the objects. The Power Packers were especially useful when at airports. I simply had to reach inside my cabin bag to get out the organiser, knowing that all cables were in the one location. Once I had left the airport behind, the packs were easy to then transfer to other bags like backpacks and my handbag. Whilst travelling in the motorhome, all cable organisers were placed in the one location, once again making access to the chargers and cables very efficient. With only a limited amount of room in the motorhome, having them all packed away makes for a nicer living area on board, free of the mess of cables and cords. We also get in and out of the motorhome a lot when we travel, and I like to take all the cables with me just in case I need them. The lightweight and compact design of the Power Packer means I just picked up the organiser and took it with me, making sure I didn’t leave anything important behind. The same would apply wherever you were staying. With the separate handle, they can even be carried by themselves. With a number of organisers, we were able to separate cables for different uses eg phones, tablets, cards, USBs etc, laptop components and drone equipment. There aren’t many. Aside from possible colour preferences, this product has performed incredibly well. The only thing I could possibly suggest would be to lengthen the external strap to allow for carrying on shoulders. Currently, the strap is quite small allowing for hand-holding only. Overall, I was very happy with the ease of use of these travel cable organisers. All returned home looking brand new and ready for their next travel adventure. Side by Side Gear provided us with Power Packers for purposes of testing and review. All editorial content is completely independent and all thoughts and opinions are our own. It’s one of those things that you see and instantly go “why didn’t I think of that”. Such a simple yet brilliant idea considering that we all have so many cables for all the devices we carry and more often than not either we misplace them or they get tangled. A great way to stay organized and certainly something I shall be buying soon. We are woven of the same neat freak cloth Kerri, so this organizer is fab. Smart idea. My wife is ummmm…..well…..I love her so, but every time I see her charger for the Chromebook or phone it is tangled and twisted and knotted LOL. Drives me a wee bit batty, because I need that orderly plug situation on the road, or at home. Great product idea. Travel all the time and was not aware of these power packs. Thank you! This is definitely a step up from my zip lock plastic bags & supermarket shopping bags!